A New look: The Rainbows have new uniforms this year, made by Starter. The green is a darker shade than in the past and more closely resembles the color you see when you look at the Koolau and Waianae mountain ranges. David Letterman has his Top 10 list. Mom carries a grocery list. Even you scribble down a list of things you have to do today. 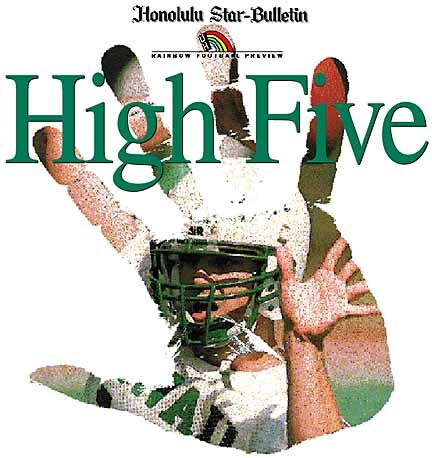 So we decided to come up with a list of our own; a high-five list of concerns the University of Hawaii must address to avoid another low-five season. But before you read on, why don't you jot down a list of your own. We've given you some hints below. If you match all five, congratulations, you know as much - or as little - as we do. OK, read on. Our complete high-five list is at the end. 1 Mr. Spock once said, "I'm endeavoring to construct a mnemonic memory circuit using stone knives and bear skin." New offensive coordinator Don Lindsey knows exactly how he feels. 2 Last year, punter Chad Shrout was caught in a vortex. Just as the football left his toe, too often it met the hands or the helmets of an opponent as it ricocheted madly into the end zone. 3 Former offensive coordinator Wally English once pointed to lineman Kaulana Noa and said, ''One day, he'll be playing in the NFL.'' Current offensive line coach Greg Olejack certainly hopes so. 4 Safety Daniel Ho-Ching walked through Bob Wagner's door, into a dark two-year tunnel with cancer, only to find a different coaching staff waiting on the other side. The secondary survives through his leadership. 5 Fred vonAppen is the commander of a ship set adrift in choppy seas. He can either guide it safely to calmer waters or watch helplessly as it is dashed on the rocks.